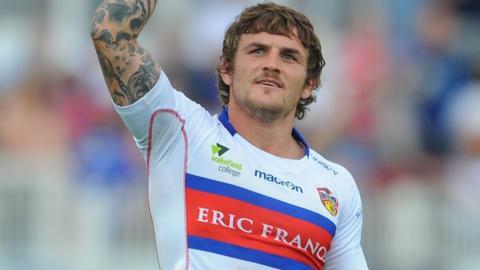 Former Hull KR winger Ben Cockayne's late hat-trick helped Wakefield ease to an ultimately comfortable victory as they bounced back from their opening-day thrashing at Bradford. After tries from Paul Aiton, Reece Lyne and Peter Fox earned an 18-10 interval lead, Dean Collis then added a fourth. Rovers hit back with two Dave Hodgson tries to reduce the arrears to 24-20. But Cockayne responded with three tries in the final 20 minutes against his old club to settle the outcome. The visitors' other two tries came from Cory Patterson and Craig Hall, Michael Dobson adding two conversions, while Paul Sykes landed four kicks for the hosts. "Hull KR fans are appreciative of Ben Cockayne and I think it's great that opposing fans respect players who have given their all for the club. "That's a great tribute to the Hull KR fans but I am sure they will be cursing him a bit tonight. "I thought Tim Smith and Andy Raleigh made a big difference to the team. Timmy is a player who, if you give him a bit of a platform, can come up with some good plays. "It will do us good to get that win in front of our own fans. We showed we can be a really competitive team if we get certain elements of our game in order. "We controlled the ruck really well and I thought it would tell late in the game." "We got ourselves in a position to win that game, but we conceded a few penalties on the run and a couple of crucial decisions went against us. "In the end Wakefield were too good and deserved to win. "We need to make sure we are more disciplined. We are giving away too many penalties. "If we get an ounce of luck and if we are more disciplined, we have a semblance of a good footy team." Wakefield: Mathers; Fox, Collis, Lyne, Cockayne; Sykes, T Smith; Poore, Aiton, Raleigh, Lauitiiti, Kirmond, Washbrook. Replacements: Wood, Amor, Mariano, Wilkes. Hull KR: Hall; Caro, Salter, Horne, D Hodgson; Withers, Dobson; Paea, J Hodgson, Walker, Mika, Paterson, Griffin. Replacements: Carlile, Cox, Ferguson, Tuimavave.